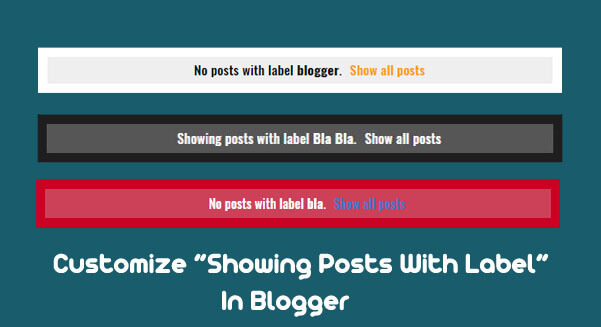 By default when any of your blog readers click the label, they are shown the message saying "Showing Posts With Label" in a simple box that most of the people dislike. So they want to get rid of that box or modify it. So in this post, we would be teaching you how to Remove or Customize the box or the message text. There are two ways to do it. The first one is by using CSS and the second one is by Editing HTML of the blogger template. Step #1: First of all, go to 'Blogger' and then 'Themes' and Press 'Edit' Button. Step #3: Replace it with the one provided below, and you are done. Now if you want to change the message text shown "Showing Blogger Posts with Label" with something else then instead of replacing the code given above just change <data:navMessage/> with your Own message text. Step #2: Place the following code above it. Now search for anything in your blog or click any label and you will see the customized box or no box depending on which option you opted for. That's all from us. I hope this works for you. If you face any problem during implementation, then please let me know. Feel free to give your feedback in the comments section below, and if you liked the post, then please share it with your friends.